Bravo for doing the muslins to attempt a good fit. I really am bad at that. Well you say you're not getting anything done but it looks like you've done a ton. Three muslins and a pair pants. Cut yourself some slack. I was thinking about the Butterick 5356 but won't bother. I'm a bigger apple than you. I guess I'm a giant apple ha ha. Get well soon. I don't like that top either, B5356. It makes for a box shape on a big chic. Is the Connie Crawford pattern the one you're using for the Great White Shirt sew-along? The second muslin is definitely better fitting in the neck and shoulders than the previous one. Keep at it. You are on the right track. You have been very busy, don't tell yourself otherwise. Its also Ok to decompress after working all year. You earned it. You will get renewed and refreshed before you know it. Burda WOF pattern is cute as can be. I think your idea of using snaps is a good one. Much better looking than the ties. Take care of yourself and let us know how you're doing. 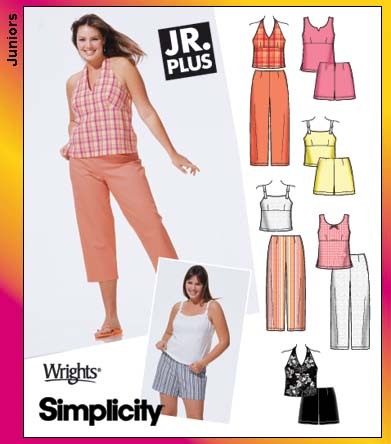 I had the same experience with that last Butterick pattern - looked like a (unflattering!) sack on me. Hope you feel better soon. If you need some guidance about the best styles for particular body shapes you can't go past Trinny and Susannah What not to wear and other books in their series. Their Brits. Second, I'm glad you kicked B5356 to the curb...and I'm always amazed at the fact that you start with a muslin. I just HAVE NOT learned that discipline! Can't wait to see the top and capris finished. I'm sure they will be fabu. Ok if that's the results of unfocused then I'm impressed. I know how you feel though. I've been on holiday for a week and a half and done no sewing! I think my mojo went on holiday too. Hope all the health stuff gets sorted out and you start feeling better soon. It's hard to believe those two Butterick 5300 muslins are from the same pattern! What a difference fit makes. I agree that it is more flattering cut closer to the body. And definitely keep the pockets! They are too cute to leave off. I'm trying to make 5356. In the instructions, there is a symbol not shown in the fabric or pattern layout direction sheet. It looks like swirls and the symbol #. What's that all about?